I have some news about The Robyn's Fetish Challenge Blog. As of the first of January, the blog has been closed. For me, this is a very sad ending since I have been a team member there for a little over 5 years. However, Robyn's Fetish Digital Stamps and More Store will remain open for you to still purchase her great images. I will be taking a month or two off to finish some projects at home and see if then I would like to sign up for another challenge team. We had the best group of ladies there and I will miss them very much. It's like loosing family. I will still be looking in on projects from other blogs. I don't want to miss your great work. I will also be posting anything that I do finish during this time off. It's sad but this will be the last post for a little while. 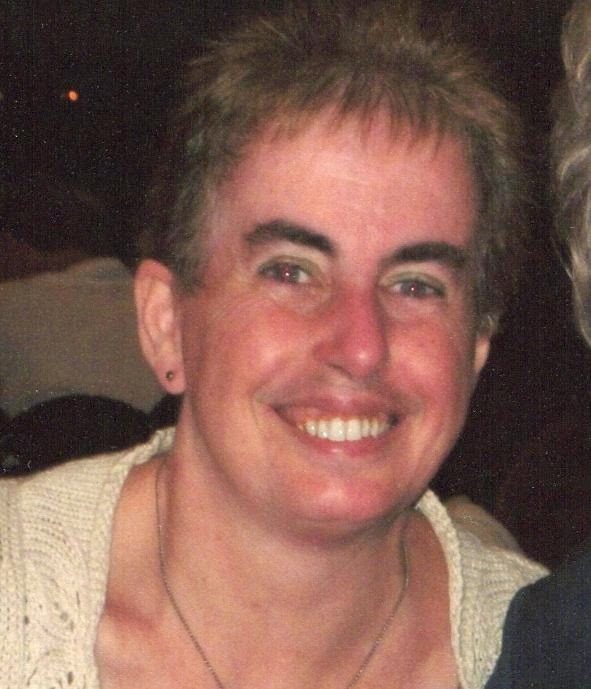 I will try and keep in touch to let you know how I am doing. Thank You for following me all these years and I look forward to getting back to the card making. ROBYN'S FETISH CHALLENGE # 348 "ANYTHING GOES"
Happy Holidays!! I'm writing this ahead of time because I will actually have all my kids home for Christmas. I wanted to spend every moment I could with them but still wanted you to read my blog with this great challenge that everyone loves. "Anything Goes" I hope you are enjoying your day also. Our very own Robyn's will be hosting our "Anything Goes" challenge this week. You can find her store at The Robyn's Fetish Digital Stamps and More to see all her beautiful images that she has. The image that I used today is called "Stevie The Snowman." He is so adorable that I have three of him on my card. I know I always make a scrapbook layout but just couldn't find any pictures of my kids in the snow. Now let's see what Robyn will be giving our lucky winner. So here is "Stevie the Snowman"
I thought it turned out to be a great winter card. You don't necessarily have to use it as a Christmas card. I love the papers I found since the snowmen look like they may be sledding down a hill. The hill is glittered paper that I made the hills out of. 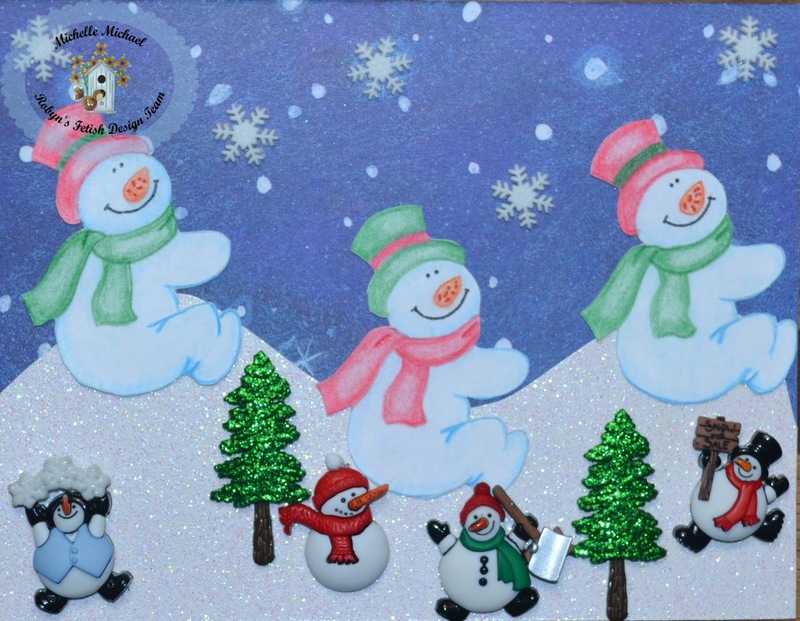 I colored the snowmen and added the embellishments. Was a real easy make. Here is the items that I did use. Glittered White Paper -- Doddlebug Designs Inc. Thank You for stopping by and I hope to see your creations over on The Robyn's Fetish Challenge Blog. Have a Wonderful Holiday and a Great New Year!! ROBYN'S FETISH CHALLENGE #347 "ADD A BELL"
Good Morning!! I hope you are starting to begin your holiday festivities. I finally have my tree up and now I'm starting to wrap gifts. Very busy week for me coming up. I hope I can get it done a little early so I can relax before our Christmas dinner. On to the challenge at hand. 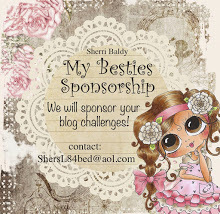 Sherri Baldy Designs is our sponsor for this week's challenge of "Add A Bell." There are two places you can find her work. 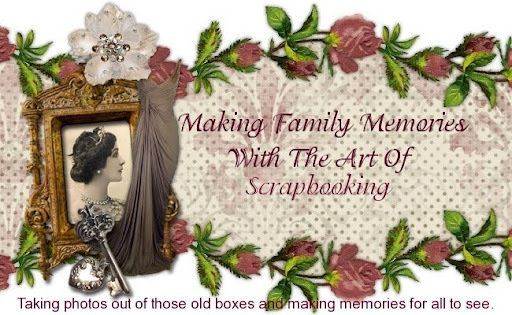 First is Sherri Baldy Designs and then Scrapbook Stamp Society. I just love these images because they have the big eyes on the girls. I don't know what it is about these eyes but I just love them. You really need and look at both of her stores. She has a lot of great images. She let me choose the image "Image 815, Gingerbread Girl." I did have a lot of fun coloring her and making this card. I'm excited to show you but I need to let you know what she will be giving to one of our lucky winner's. You will see the three different images on The Robyn's Fetish Challenge Blog that our Design Team used. Remember this little cutie will be one of the images. Let's see here. I hope you like this. I have noticed that Christmas Cards are starting to use different colors besides the traditional ones. I had this pink paper in my stash for awhile and decided to use it and make the gingerbread girl dressed in pink. So all the items I used was in my scrapbooking room from times that I just picked something up on one of my shopping trips. You can use any colors you want to make this. I want to Thank You again for reading my post and hoping that you get inspiration from the card that I made. Have a Wonderful Week!! ROBYN'S FETISH CHALLENGE # 346 "CHRISTMAS CARDS WITH A DIE-CUT"
Good Morning!! Hope is all well with you. I have to say that this week went real fast and then Saturday was great. My son brought up his kids and bought a kit to decorate Gingerbread Cookie Ornaments. We had fun making the ornaments with all the icing and different types of sprinkles. Of course, when we were done, they ate all the left over icing and sprinkles. It was so much fun doing this with them. Times like these are things I will treasure forever. For this week's challenge our sponsor will be Ppinky Dolls. This is a big etsy store that has more than just digital stamps. They also have jewelry, vintage items, clothing and accessories. I was able to use their digital image "Christmas Gift." She is an adorable little girl with a mouse that looks like it's running toward her carrying a Christmas Gift. 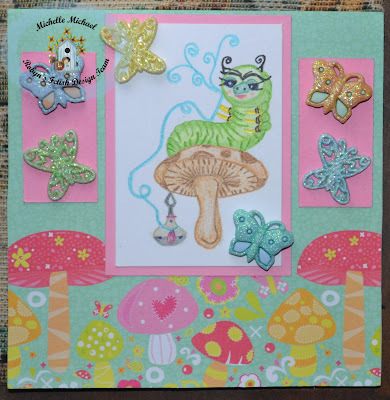 But before I show you the card that I made with their image I will tell you what the prize is for this week. 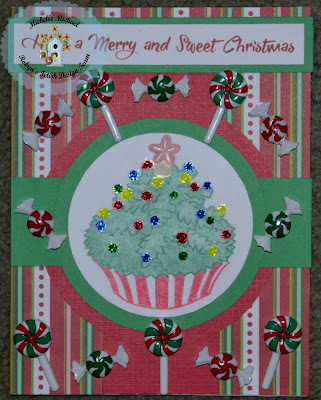 Here is the card that I made with "Christmas Gift"
I used a snowflake paper as the background. Added blue paper so you can see the Holiday die-cut that is cut with the same paper as the background. Then I added glitter to the girl and the girl and mouse. I then glittered the bow and put a bell in the middle of it. Added more gifts and put a couple of snowflakes at the top. It is a square card because of the die-cut that I used. This is the end again. My card and the rest of the Design Team's cards are on The Robyn's Fetish Challenge Blog for you to look at and find some inspiration for the card that you want to enter at the same time. I do hope you enjoyed this post and I'm really open to some comments to let me know how I'm doing on my cards. Have a great week!! ROBYN'S FETISH CHALLENGE # 345 "SQUARE OR RECTANGLE CARDS"
Hello To All!! Hope you had a great first couple of days of December. It was great here. My husband surprised me with a gift this week of going out of town for a night to get away from reality. While we were there he had another surprise gift. A beautiful bracelet that has I with a Heart and U and between each time it's repeated there is an infinity sign in between. It's also the start of Christmas shopping and I did get some this week. My husband even spent Friday with me shopping for gifts. Thank You Tony and Happy Anniversary!! Here is our sponsor this week with a very catchy name. 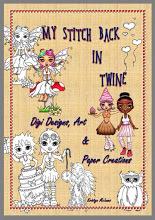 My Stitch Back In Twine. This is a great etsy store to go and look through the images. She also has Pre-Colored images and some images for steampunk which is popular now. The image that I used from this store is, "Underland Caterpillar." This is an adorable Caterpillar that sits on a mushroom. The face is what caught my eye. Here is what they are giving to one lucky winner this week. Is she not a cute caterpillar? So, since she was sitting on a mushroom, I had found this paper in my stash with the other mushrooms and thought it would be a perfect fit. 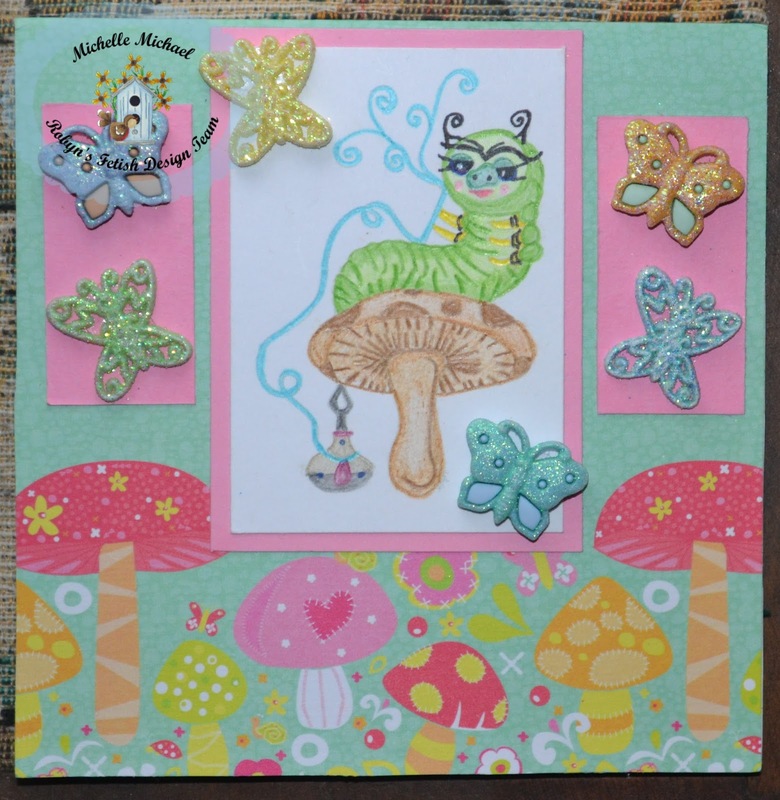 There were little butterflies around the mushrooms so I put some butterflies around the caterpillar. We had to make square or rectangle cards so mine is square. 5 x 5 inches. Here is the few items that I made this cute card with. Here is the end of the post. Please visit Robyn's Fetish Challenge Blog and look at the other cards that our design team made for this challenge. You can also see our tutorials and enter our challenge. Hope you have a Wonderful Week and I will be back next week with a new challenge. Thank You!! ROBYN'S FETISH CHALLENGE # 344 "STRIPES OR DOTS"
Hello!! Welcome to my blog today. Hope is all well with you. I hope you have a Wonderful Thanksgiving with your family and friends. I actually had all three of my children home for dinner. It's very seldom that they are here all at once. We all actually sat and watched a movie together before my one son had to leave to get his daughter. This was a memorable holiday. As you can see from up above Limited Runs Digital Stamps is our sponsor for this week's challenge. She has a Wonderful blog and for the month of December she will be having specials on her stamps. Just check in every couple of days. She let me use this cute image called, "Christmas Tree Cupcake." I love cupcakes and Christmas also, so this was a great image to work with. My picture didn't turn out the best but the tree has shading on it. It's just really hard to tell. 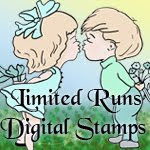 Let me tell you about the prize Limited Runs Digital Stamps is giving to one lucky winner. I try to name all my cards so this one is "Sweet Christmas." I hope you enjoyed my yummy cupcake. I thought the candies looked great with the image. We do get all these sweets at Christmas time. Here is how I put this card together. I found this piece of paper that had both stripes and dots so I thought it would be perfect. Added red and green cardstock in different ways to focus on the image I was using. Added the image I colored and glittered. Last but not least, added the bright candy suckers and candies. It was very easy once I had the sketch done. Here are the items I used. I do Thank You for stopping by. My card and the other Design Teams cards will be displayed at The Robyn's Fetish Challenge Blog. Please add your card to our challenge and take a chance on winning. It's very simple. Hope to see you next week for another special challenge from The Robyn's Fetish Challenge Blog. Have a great first of December!! ROBYN'S FETISH CHALLENGE # 343 "LACE AND GEMS"
Hello Everyone!! Well, we are officially in the cold winter weather here. I'm loving the cold. I always have and probably always will. The sleet and flurries was great to see. Can't wait to see one big snow storm. You will like our sponsor this week. It is Star Stampz which is also called Star In My Pocket. The category that I love is the one called "Storybook And Fantasy." This is where I used an image of hers called, "Sleeping Beauty." She is absolutely beautiful just sleeping in her bed. So, when I went looking for things to make my card, I had way more than I was going to use. I just wanted to do it justice. Let me tell you the prize that Star Stampz will be giving before I show you my card. Here is my card that I did name "Sleeping Beauty." I have to say that I love this card. 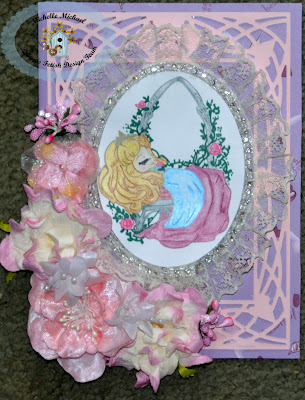 My grand daughter loves the Disney Princesses and this will be a beautiful card for her birthday. I'm hoping my son will keep it for her to look at when she gets older. These cards do take a lot of time to make. You can't see it but the purple paper has crowns and the saying, "Beautiful Princess." You can see it on the back. Made the frame with my Big Shot and a stencil to make the oval around the picture. Surrounded the oval with the lace and gems. Lastly I added the flowers that looked the best together. Here is where the items I used to make this card came from. I want to Thank You for looking at my card and reading my post. Please feel free to leave a comment even if it's one word. Also, look at the other storybook images that our Design Team made at The Robyn's Fetish Challenge Blog. Let,s see your card with lace and gems. Hope to see you next week for our next challenge. Have a Great Week!! !